Microsoft launched Windows 10 in June 2015, two and a half years ago. According to data gathered in January 2018, Windows 10 reached 42.78% in terms of worldwide internet usage, compared to 41.86% for Windows 7, 8.72% for Windows 8.1, and 3.36% for Windows XP. Office365 might be the jewel in the crown for Microsoft, but a new version of standalone Office has been announced for Windows 10. Office 2019’s desktop applications will only run on Windows 10 – and has shortened support. In an update published on February 1st, the company revealed that the beta apps for the perpetual version of Office 2019 – as opposed to the subscription Office 365 – will appear in 2018’s second quarter and a final release will ship in the second half of the year. When the software lands, it will only run on Windows 10 or the next Long-Term Servicing version of Windows Server. For Windows 10 users, only the Semi-Annual or Long-Term Servicing Channel editions of the OS will run Office’s apps. Microsoft said this is because “As the pace of change accelerates, it has become imperative to move our software to a more modern cadence.” Which is a bit inconsistent with news that Windows 10 Enterprise LTSC 2018 will land “in the fall of 2018” and get five years of extended support. Another change Microsoft’s is to make Office 365 ProPlus, the business-oriented version of the service, available only on Windows 10’s semi-annual channel. As of January 14, 2020, Windows 8.1, Windows Server 2016 or older and Windows 10 LTSC releases won’t run ProPlus. Nor will unsupported Windows 10 semi-annual releases. This will keep Windows 10 and ProPlus in synch for security reasons. Those companies that deliver ProPlus to virtual desktops or over remote access will have a chllenge. Later this year, “new Remote Desktop and desktop virtualization capabilities within the SAC release cadence of Windows 10 Enterprise and Windows Server.” Windows Server Insiders will see those changes before other users. New and improved inking features—like pressure sensitivity, tilt effects, and ink replay—will allow you to work more naturally. New formulas and charts will make data analysis for Excel more powerful. Visual animation features—like Morph and Zoom—will add polish to PowerPoint presentations. The Microsoft Excel team blog has moved to https://blogs.technet.microsoft.com/the_microsoft_excel_support_team_blog/. it seems to be missing the tutorial style content it used to have. Meanwhile here are 40 excel tutorials you might find useful – https://dgtl.link/excel_tutorials. Microsoft is the only major CRM provider to embed external customer data, millions of key contacts, and timely, actionable insights within CRM at no additional cost. Relationship Insights, which as the name suggests gives sales people information about the status of their customer relationships at any given moment is built on the on the Cortana Intelligence Suite, which Microsoft introduced in 2015 and uses tools like sentiment analysis to check on the likelihood of the deal closing and the next best action to take. Insights 4.0 by Insideview is included at no additional charge in all Professional and Enterprise subscriptions of Microsoft Dynamics. It offers a more streamlined, seamless user experience within the new Microsoft Dynamics 365, as well as the current version Microsoft Dynamics CRM 2015. – Custom field mapping to allow Insights data to easily update company and contact records in Microsoft Dynamics 365. - Social feed suppression to enable/disable social media integration. - Social media stream customization to tailor the individual user experience. Dynamics 365 refers to the Azure-based combination of customer relationship management (CRM) and enterprise resource planning (ERP) services. At the core of this solution is what Microsoft simply calls as Intelligence, which is actually constituted by advanced analytics and machine learning technologies. It powers the apps within Microsoft’s cloud service that provides a range of functions for business such as sales automation, operations and customer service. Companies can integrate all of this data with internal metrics (KPIs) to drive automated actions based on the data. The solution includes partner data from the likes of Facebook and Trip Advisor (proving you don’t need to own an external data source to take advantage of it). This integration will allow Dynamics 365 for Sales users to quickly build customized predictive models that score and prioritize leads, enabling sales and marketing to know in advance which consumers and businesses are most likely to purchase their products or services. The integration will also generate new, highly targeted prospect lists from the predictive model to drive campaigns, including email, phone, direct mail and display audiences, with increased customer conversion. At convergence in Orlando last year Delve was part of of demonstrations featuring Gigjam and Cortana Analytics but what does it do? In Microsoft Office 365, Delve is the app that tracks and stores your activity. The new feature for Delve is called ‘boards‘. The boards concept gives employees a new way both to organize and to share content with fellow employees and the enterprise in general. Delve can now also be the app that lets you organize your activity. For example, when working on a specific project create a board dedicated to that project, and attach every document, video, meeting, and image your team creates. From that board, share everything with some or all of the entire enterprise and potentially let everyone in the enterprise add to the board for the project, depending on what permissions you establish. Enterprise wide collaboration and document sharing . Is this useful? 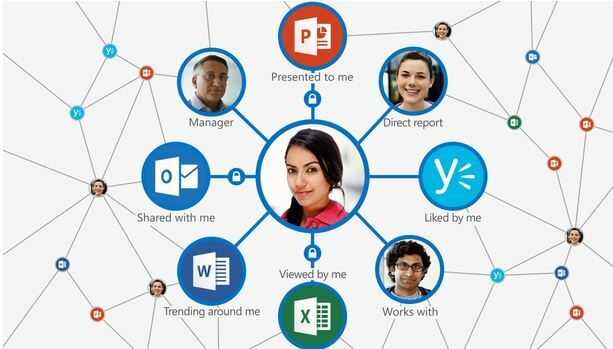 There other collaborative tools from SharePoint to to Yammer, to Skype Business. Microsoft’s vision of a global mobile workforce, means collaboration comes in the form of sharing documents and easy Skype meetings, Delve boards shared amongst team members makes sense. But sharing that collaboration, with all its rest of the enterprise seems like more of a distraction and much less useful. Much like Facebook can be full of random junk or be a targeted focus group similarly Yammer can invite constructive feedback or just be a mass waste of time with uninformed contributors making ill informed comment or reading such comments out of context. We have all suffered the email tsunami of being copied on endless minor updates on trivial matters more driven by office politics than business sense. From the rest of the enterprise’s point of view, do we really need or want to know what every small team from finance to marketing is working on for a particular client? Most of us have enough trouble tracking our own activity, let alone worrying about everyone else’s. Will all employees will be willing to share their work with the rest of the enterprise using Delve and the boards system – what if a project is not going well? Some policy guidelines and monitoring need to be thought about before adoption. The new mobile, always connected, social media focused, collaborative workforce of today are looking for similar features to support their work effort. But does it really help when people who sit next to each other above to communicate by email; or sit around a dinner table communicating by text messages? Collaboration between and amongst small groups working in teams is the backbone of any enterprise. However, vast dissemination of that small group collaboration sounds like noise. Where such a tool helos is that you can self serve to find information without it having to be pushed. Users can read what they want when they need, and not have their email boxes filled multiple attachments they don’t need to read. Its easier to mass communicate when users opt in. Security policies and controls need to be considered. Microsoft Office 365 Delve is an interesting application. Like all tools in needs training and experience/expertise to get best use. It will be particularly helpful for those teams that are part of a mobile workforce. The addition of boards gives teams a different tool to help organize and to coordinate their collaborative activity. So well done Microsoft for keeping Office 365 fresh with new features and just as with any other office products use it when appropriate. This toolset is regularly being updated with new features e.g. : – dashboards, new visualizations, support for popular software-as-a-service applications, a native iPad app and live “hybrid” connectivity to on-premise SQL Server Analysis Services tabular models. What is Power BI Q&A? 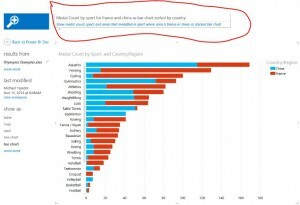 Use natural language queries to find answers in your own data. Start with a question, and have fun traveling through your data refining or expanding your question, uncovering trust-worthy new information, zeroing in on details and zooming out for a broader view. You’ll be delighted by the insights and discoveries you make. Power BI Q&A presents your answers in the form of visualizations. 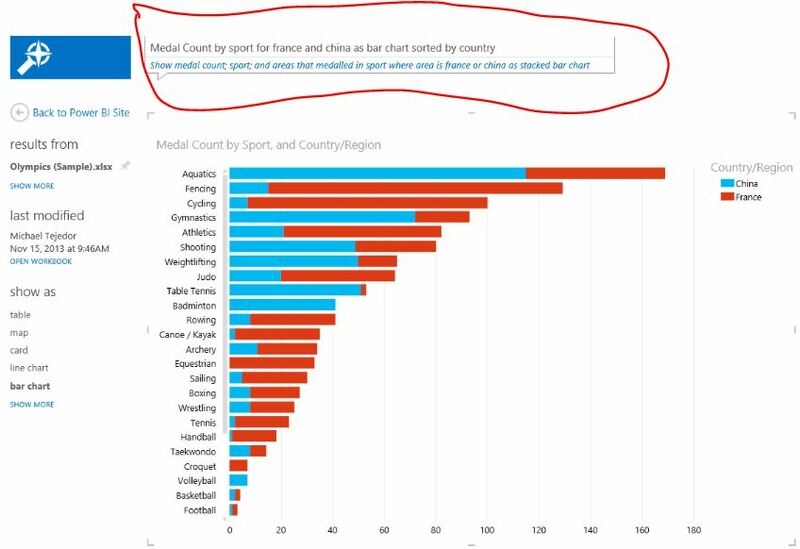 As you type a question, Power BI Q&A picks the best visual to display your answer; and the visual changes dynamically as you modify the question. • Exchange: Support for connecting to your Microsoft Exchange account and retrieving information about your Mail, Calendar, People, Tasks and Meeting Requests. • Dynamics CRM Online: Power Query’s OData support to consume OData feeds from Dynamics CRM Online. also Facebook, Salesforce, Sybase etc. A wave of native mobile apps for Power BI. These apps will allow users to access their Power BI dashboards and reports through immersive mobile experiences for iPad, iPhone, and Windows tablets. The first of these – the iPad app is available today and can be downloaded from the Apple App Store, with other platforms following in the coming months. All Power BI mobile apps enable users to share insights and collaborate with colleagues so that they can take immediate action, from anywhere, anytime. The Power BI Designer is a new companion application for Power BI. It is a standalone Windows Desktop application that can be downloaded from the Power BI site. The Add-ins for Excel 2013 and later are still available and customers can continue to use that to model their data and build reports. The Power BI Designer will be another option and allow customers with an older version of Office to be able to create reports. Is my data safe in the cloud is a bit like asking whether your money is safer in the bank or under the bed. Banks also get robbed but in general are better protected than most other options. - is there a highly seasonal or variable demand for system use? - is it economic decision to take advantage of the cloud’s economies of scale, or to smooth out cash flow, or to get more predictable IT costs ? Such questions will help you to determine which is the best datacenter and cloud provider for your circumstances. – the likelihood of man-made problems like terrorism or industrial disputes. - the available skilled workforce, the quality of life on offer, what is the staff turnover> and certification levels? - is the local bandwidth and latency the same everywhere. - -will your cloud provider include a thin client in the pricing or might you also need to purchase Citrix or similar technology? - does your business store large graphic or media files , will those also be in the cloud? What is the likely upload and download time? - What about printing time and cost for large documents? - What about BI? How fast will it run across the cloud? - – Where will you site your Active Directory server? Will you also use ADFS? - Does the cloud data centre provide the necessary viewers? - the government, legislative and business culture. If governance is a critical factor for choosing a home for company data then to avoid government snooping, find a friendly country – and first define what friendly means. - can you undertake your own audits? - what managed services are provided? - are costs transparent? Have you budgeted for test and live systems, or for reporting databases, for back up storage? What if you want to move data between test and live – what is the time the cost, and who can do it, when? - is your requirement for heavy processing for a few hours a day or do you need an always on transactional system.? I.e. a fixed cost or another monthly utility bill? Who is going to estimate the capacity and cost for usage based? How does that vary during implementation when you are data loading and developing, and during live operation? How does this impact costs when pay on a usage basis? - what are the payment terms and what happens if you are late or miss a monthly payment? - if you decide to move to another provider what assistance can you expect, how long will it take to move the data at what usage cost? - Will you take your own back-ups to an on premise location, how will you test those the back up restores will work outside the cloud environment? - Do the service levels, SLAs and up time statistics typically reflect 5 x 8 hour operation or 24 x 7 operation? - and how do those factors compare to your own backyard? Any company that distributes high volumes of content will be a large bandwidth user and will want to be located near to strong network hubs. This is why established internet exchanges in e.g. London, Amsterdam and other hubs continue to attract local business. Dubai has long had major data centres and Synergy Software Systems offers cloud hosting as a private cloud in Dubai, as an IAAS service on Azure through Microsoft, or via level 4 international data centres in Europe and Asia, particularly for SPLA licensing of Dynamics Ax and Dynamics CRM. Another powerful but undocumented reason why few data centres hosts migrate is that the expertise has become localised. Staff that have the experience of building data centres and running them have some of the rarest skills in IT. Recruiting these specialists is incredibly expensive and time consuming, so it’s often easier to take the data centre to the areas where they live. Dubai has a modern infrastucture and a ready supply of skilled IT engineers and we expect to see local cloud providers increase. Major vendors solution road map are increasingly heading to the cloud. Microsoft with Azure is now taking all its apps to the cloud. Not only Dynamics CRM on line and Office 365 on line but also erp systems like Dynamics Ax. Solution development features and pricing is increasingly favouring cloud users. If you plan to use Office 365 , with a hosted erp system in the cloud then consider whether your erp system integration with Office apps will work on line or wether you will still need on premise office licences. The US is the leader in providing cloud computing services across the globe, dominating every segment of the market. In the 2013 Informa Cloud World Global Insights survey, 71% of respondents (of whom only 9% were from North America) ranked the US as the leader in cloud computing usage and innovation. In this same survey, 9 out of 10 respondents linked cloud computing to their country’s economic competitiveness. Revelations about the extent of USA government agency surveillance of private data has exacerbated concerns about locating data centres there. The National Security Agency (NSA), and other US law enforcement and security agencies, exploit the Foreign Intelligence Surveillance Act (FISA) and Patriot Act to snoop on foreign electronic data is forcing foreign companies to consider their options. A report from the US- based Information Technology and Innovation Foundation, suggests that post-PRISM concerns could cost US cloud computing firms up to $35bn in the next three years should foreign companies feel storing data in the US is too risky. Meanwhile, a stable banking sector, strong consumer spending and a solid economic outlook, a skilled workforce, and modern infrastructure and a climate that makes cooling servers much less costly are factors, making Canada a preferred location for foreign investors seeking safety and growth, according to Cushman & Wakefield’s Data Centre Risk Index 2013. Despite natural disasters like the US is still generally seen as a low-risk location. The ability to recover from Hurricane Sandy impressed analysts and the US still has the highest internet bandwidth capacity of all the countries measured by the International Telecoms Union (ITU) and the average cost of electricity, while not the cheapest, has stabilised and is relatively low. The costs of Canadian labour and energy have reduced since last year, according to the World Bank. Canada’s international bandwidth is ranked 11th in the world. The construction of a new submarine broadband cable in 2014 and will bring better links to global commercial markets. Canada attracts increasing investment from operators and occupiers and its cold climate is perfect for free cooling. In 2012 a policy document entitled Unleashing the Potential of Cloud Computing in Europe, the European Commission (EC) called for a number of steps to promote cloud computing adoption in Europe, including creating pan-European technical standards, EU-wide certification for cloud computing providers, and model contract language. UK is highly ranked thanks to its international internet bandwidth capacity and ease of doing business. The combination of recession and a recent construction boom means there are plenty of empty data centres in the UK. - Documents stored in an erp system are usually static in contact because those relate to specific transactions and time and should not be subject to changes and version control. - There may be document workflow processes outside of erp. Filehold is a modern feature rich comprehensive document system which integrates with SharePoint and we extend it with Arabic OCR. It is available on premise or on-cloud. What is the mix of document types e.g., what % are created soft copy by applications e.. erp systems, email systems and thus don’t need scanning or physical printing and filing , and how many are received as hard copies e.g. faxes, or printed contracts? Do you receive faxes as hard copy print outs or do you use a fax software to send and to receive? Will hard copy documents need to be scanned? If so, then will there be a central scanning department or will users have individual access to scanners? Do you already have scanners in place? Is OCR scan conversion required? If so then does this need to be multi lingual e.g. Arabic or English? Do you need to ocr scan dual language within the same document? e.g. a bi-lingual Arabic-English contract? How much integration is needed to other systems and how easy is this e.g. from within email systems, or within erp systems? will the document management system work with you collaboration system e.g. SharePoint? Does it offer version controls? Does it offer workflow approval processes? What will be done about legacy hard copy documents- how many are there? How long would it take to unbind, scan, ocr convert, index, and then re-file? Does it provide the right security Access controls to digital documents rather than to physical documents? Which physical documents will still also be filed? How should it be phased in e.g. by one function or one department at a time? For a knowledge-worker time is money. If the average annual cost of an engineer is ~$100k then how much of that workers time is consumed searching for amendments in paper contracts? Modern businesses create complex contracts that often require multiple revisions and many authorizations. Creating and managing those contracts electronically in a document management system saves time and frustration and ensures that everyone is working with the most current version of a document. Filehold provides important features for contract management that : maintains security, allows users to collaborate, provides alerts and reminders as to contract expiration or renewal dates. It is essential that the solution allows project users at site users to look at and even check out contract documents from anywhere in the world from where they have access to the Internet. Engineering organizations and engineering departments create large and complex design and report documents. Being able to put these documents into a document management workflow for review and approval saves time and money. Tight version control ensures everyone uses with the most recent version of a document. •	Version control to ensure the correct prices, designs and contractual terms are used. If you are drowning in documents and want to streamline our business, reduce errors, improve collaboration, reduce errors and ensure compliance then document management is often one of the fastest solutions to implement with the quickest ROI. the 65.536 rows limit in an Excel sheet was removed with Office 2007/2010 with the introduction of new Excel format XLSX. SQL Server Reporting Services lacked XLSX file export support in SQL 2008 and ealier versions. That means you won’t receive the error messages like below. However think twice before generating an XLSX file with millions of rows. Who will open this Excel sheet with millions of rows in it ? Even if the answer “I will reach this XLSX file programatically not directly opening with Excel” rmemebr that Excel files are not intended to be used as a database! Dubai in the cloud? Office 365? When you are starting up or need a new solution fast then a cloud based solution rather than an on-premise one will get you up and running without the cash flow hit. . . . at least in the short-term. However, if you implement a major business application then you still need comprehensive business process mapping, data cleansing, organizational change management, end-user training , data migration local support etc. The cost structure of cloud ERP avoids paying a lump sum up-front, either for hardware , software, product install, or day to day IT staff but organizations must pay for yearly subscriptions to their cloud provider. So it’s an easy way to amortize a large upfront expense witrhout punitive bank loans or mortgages. You also don’t need to worry about the cost of applying patches and upgrades or resizing hardware, or the cost of back up tapes nor the space costs of a server room (what is the opportutnity cost of the space in a amjor city?) and the energy costs that go with it, not to mention insurance and support costs for the hardware. However if the business cash flow should cash dry up, then you may find it impossible to pay for the subscription – you dont just lose support, you may lose your entire system. Vendors need to make a profit so ultimately they have to cover the cost of the up front finance. Cloud applications therefore generate more predictable revenue and higher long term revenue. There are many successful solutions particularly in the CRM space. Why am I writing about this now? Well Microsoft recently invited me to particpate in one of the partner surveys about our awarenes of, and our business plans, re the cloud and use/planned sales of specifically Azure and other providers like Amazon web services. So I ahd to think – we sell some cloud solutions but we not likely to be a host of the cloud – we implement and support. So how might it change our future and offerings? In this region there has been cautious adoption . Of course most of us use the cloud without thinking about it when we buy books on line or upload photos, or use web email, or Facebook etc. So what about erp solutions like Dynamics Ax . We have been able to offer this for a long time on the cloud but clients in this region are still concerend about proven reliability – there have been some prominent site outages this year, and about risks to their data. I am less conerend about secuirty – if you choose a major provider then they will have a Fort Knox equivalent data centre physical security with appropriate back up, disaster recovery, firewalls, virus protection, and skilled staff etc that will be far safer than most on premise networks. For me the problem is more about the contractual and support side which seems much less clear..
2. Will we still own our data? a crucial question to ask your ERP cloud provider before the purchase- how and in what format will the cloud provider deliver your data to you when you cancel your contract – how long will that take . 3. How to choose the ERP cloud provider? Few will have a cloud track record, but lots of satisfied customers is always a good sign . Check the uptime guarantees, service level agreement (SLA) and other terms and conditions and whether these cna be substantiated and what happens if those are not met . Check the vendor is operating on a large enough scale with redundant infrastructure facilities in the case of a natural disaster at their primary facility. What is their financial stability. WIll your data be in the sama server as others on a shared database, or will it be dedicated for you? How does the application licensing work if the cloud provider is not the application vendor? 5. Will a cloud-based ERP system be able to integrate with the other line of business applications that we use? ERP solutions with integration tools will allow you to integrate to other on premises and cloud based solutions. Can you customise for your business, or is it a common build offered to all clients – i.e if the system is enhanced for you then all other users similarly benefit. A common build will tend to be continually improved and be easier to upgrade maintain – Birch St is a typical product that works on this module for Hospitality procurdment. 6. Will there be connectivity and response time issues Check the latency and bandwidth requirement per client – consider report printing and BI. Response time is a key factor for the user with a cloud based system. Flex system is a powerful user friendly cloud BI system – its in memory processing ensures exceptional processing response time. Ask us! Its a well kept secret here but is widely used in financial services in Asia. 7. What if the internet connection goes down? Consider a redundant internet service to ensure continued operations even when your primary ISP goes down this may also help you to load balance and peak times . Many organizations find that a redundant system also helps with load balancing during high usage time. 8. What if the cloud provider is offline? The SLA (Service Level Agreement), should define uptime guarantees and explanation of the redundant systems in place to protect against major system failure – 99.9% uptime means in the worst case scenario that your system isdown less than 8.76 hours per annum – probably better than an in house system . 9. What about add on customised developments? Will these work with a cloud based application ? This will become more common as the cloud usage expands, but there will be an additional cost to adding ISV applications to your hosted or cloud system. Microsoft has now entered this space with 2 million clients for Office 365 in a very short time. For small businesses this is a quick way to get up and running at a known cost with Office Professional, SharePoint, Exchange server and Lync with the only requirement being an internet connection,- instant productivity with the possibility of Skype or other VOIP phone systems. Ask us for details. However, it can also be a big boon for large companies as a way of outsourcing these IT functions – useful when skilled resources are scarce /costly, and when office rents are high, and the company wants to stay compliant with ITIL, and the latest technology, or has variabe staffing e.g a project based company or is experiencing rapid growth which is outstripping systems. This seems to me where the cloud will get established and will lead to wider acceptance of erp on the cloud. Meanwhile apps stores are increasingly adding business apps and Microsoft now also runs an apps store to complement its products. expect to see SaaS models evolve around web services e.g pay for a credit card gateway on an ad hoc per use basis. Search your company information quickly with the familar Google, context-sensitive ,Search Appliance. Universal search is the ability to search all content in an enterprise through a single search box. Although content sources might reside in different locations, such as on a corporate network, on a desktop, or on the World Wide Web, these appear in a single, integrated set of search results.